Elvex Level Dependent muff uses technical components and features and is tuned for continuous industrial noise. Communications features allow you to have close range communications in select continuous noise environments. The microphones on the outside of the ear muffs "listen to" the environment and can amplify weak sounds, and the gain limiter suppresses sounds exceeding 82 dB. Frequencies below 400 Hz and above 4,000 Hz are not processed and therefore the speech to noise ratio can be improved in many continuous noise environments. An impulse (or impact) filter electronically eliminates impulse sounds by closing down the circuitry in four milliseconds, and opening the circuitry again in about 1/4 second (in order to prevent echo effect). 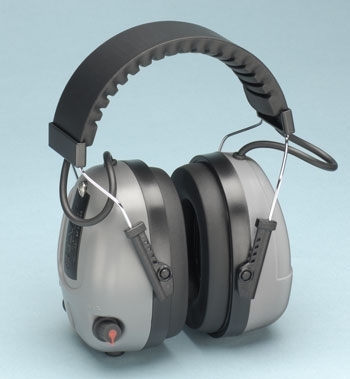 This feature makes Elvex Impulse hearing protection very effective on the shooting range. The gun shots are eliminated, but the shooting instructor can still be heard. An audio jack (3.5 mm jack) for connection of radios is standard. This jack will provide listen-only capability (not two way communications). You can hear both the auxiliary device and Com-655. Com-655 uses two 1.5 Volt AAA batteries. Batteries are included. The headset will operate for approximately 175 hours on one set of batteries, under normal circumstances. Reception is stereophonic. An auto off switch will turn off the headset after four hours of continuous use, in order to conserve battery use.